(Nanowerk News) Scientists combined buckyballs, which resemble tiny soccer balls made from 60 carbon atoms, with graphene, a single layer of carbon, on an underlying surface. Positive and negative charges can transfer between the balls and graphene depending on the nature of the surface as well as the structural order and local orientation of the carbon ball. Scientists can use this architecture to develop tunable junctions for lightweight electronic devices. Charge transfer at the interface between dissimilar materials is at the heart of almost all electronic technologies such as transistors and photovoltaic devices. 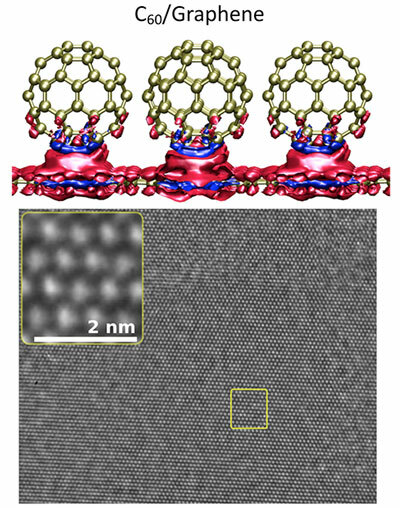 In this study (ACS Nano, "Molecular arrangement and charge transfer in C60/graphene heterostructures"), scientists studied charge transfer at the interface region of buckyball molecules deposited on graphene, with and without a supporting substrate, such as hexagonal boron nitride. They employed ab initio density functional theory with van der Waals interactions to model the structure theoretically. Van der Waals interactions are weak connections between neutral molecules. The team used high-resolution transmission electron microscopy and electronic transport measurements to characterize experimentally the properties of the interface. The researchers observed that charge transfer between buckyballs and the graphene was sensitive to the nature of the underlying substrate, in addition, to the crystallinity and local orientation of the buckyballs. These studies open an avenue to devices where buckyball layers on top of graphene can serve as electron acceptors and other buckyball layers as electron donors. Even at room temperature, buckyball molecules were orientationally locked into position. This is in sharp contrast to buckyball molecules in un-doped bulk crystalline configurations, where locking occurs only at low temperature. High electron and hole mobilities are preserved in graphene with crystalline buckyball overlayers. This finding has ramifications for the development of organic high-mobility field-effect devices and other high mobility applications.